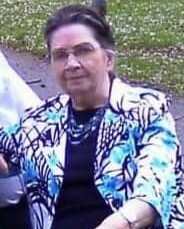 Jessie McCarty Sloan, 84, of Flatwoods, passed away April 9, 2019 at her home. Mrs. Sloan was born in Scioto County, Ohio, June 8, 1934 to the late Burley and Dora Salyers McCarty. In addition to her parents she is preceded in death by her loving husband Golden Douglas Sloan; three brothers, James McCarty, William McCarty and Paul McCarty; four sisters, Esther Roach, Jean Flack, Verna Dyer and Margaret Ann McCarty. Jessie was a member of the Martha United Baptist Church in Raceland. She loved to read in her spare time and was an active care taker for not only her family but many in the community. When she was away from church and out of the house you could find her walking around the mall. Jessie was also a past member of the Flatwoods Fire Department Ladies Auxiliary. She is survived by four adoring daughters, Vickie (Wesley) Pigman, Rhonda (Jack) Todd Jr., Susan (Roman) Vlcek, Peggy (Thomas) Kemper; grandchildren, Kenneth Pigman, Kasandra Saylors, Joshua Sammons, Clifton Dean Fain II, Robert Montgomery, Tracy Kemper, Marvin “Joey” Montgomery, William Montgomery, Douglas Newsome, Travis Newsome, Joseph Holley, Jessica Todd, Edvan Kemper, Jeffry Todd, and Anneliese Vlcek; 12 great-grandchildren; two brothers, Franklin D. (Connie) McCarty and Burley Ray (Rosemary) McCarty; brother and sister-in-laws, Forrest Dyer and Eleanor McCarty. Funeral services will be at 10:00 a.m., Saturday, April 13, 2019 at the Westwood Falls United Baptist Church. Burial will follow in Bellefonte Memorial Gardens. Visitation will be from 6:00 to 8:00 p.m., Friday, April 12, 2019 at Carman Funeral Home in Flatwoods. In lieu of flowers donations are suggested to the Sand Gap United Baptist Church Building Fund.